I hope you enjoy this project, it was really quick and easy as well as fun to make. This card featured the Friendly Conversation Stamp set. This is from the 2018/2019 Annual Catalog. If you have time, give it a try and let me know how it goes. Be sure to check out all the sizes and dimensions below as well as download the Free PDF for you to keep. 1. Cut a 4-1/4″ x 11″ piece of Whisper White Cardstock and fold it in half. This is your base. 2. Cut a 4-1/4″ x 1-1/2″ piece of Lovely Lipstick Cardstock. 3. Cut a 4-1/4″ x 1-1/4″ piece of Lovely Lipstick Cardstock. Center and adhere this pieces on top of your larger Lovely Lipstick Strip. 4. Cut a 4-1/4″ x 1-1/2″ piece of Granny Apple Green Cardstock. 5. Cut a 4-1/4″ x 1-1/4″ piece of Granny Apple Green Cardstock. Center and adhere this pieces on top of your larger Granny Apple Green Strip. 6. Cut a 4-1/4″ x 1-1/2″ piece of Highland Heather Cardstock. 7. Cut a 4-1/4″ x 1-1/4″ piece of Highland Heather Cardstock. Center and adhere this pieces on top of your larger Highland Heather Strip. 8. Next, lay out your strips so you can see the spacing. Tip: The first strip should be about a 1/4″ from the top. Each white space will be approx. 1/4″ and there should be (4) total. 9. Once you’ve figured out your placing use liquid adhesive to add your strips. 10. To finish your base wrap white bakers twine around the card base between the Granny Apple Green and Highland Heather Cardstock and tie a decorative bow. 1. Cut a 4-1/4″ x 3-1/4″ piece of Whisper White Cardstock. This piece is to mat your sentiment. 2. Cut a 4″ x 3″ piece of Whisper White Cardstock. This piece is for your sentiment. 3. Stamp your sentiment using Night of Navy Ink. 4. Stamp your sentiment again on Lovely Lipstick, Granny Apple Green and Highland Heather Cardstock using Night of Navy Ink. 5. Carefully cut out the specific word from each color. 6. 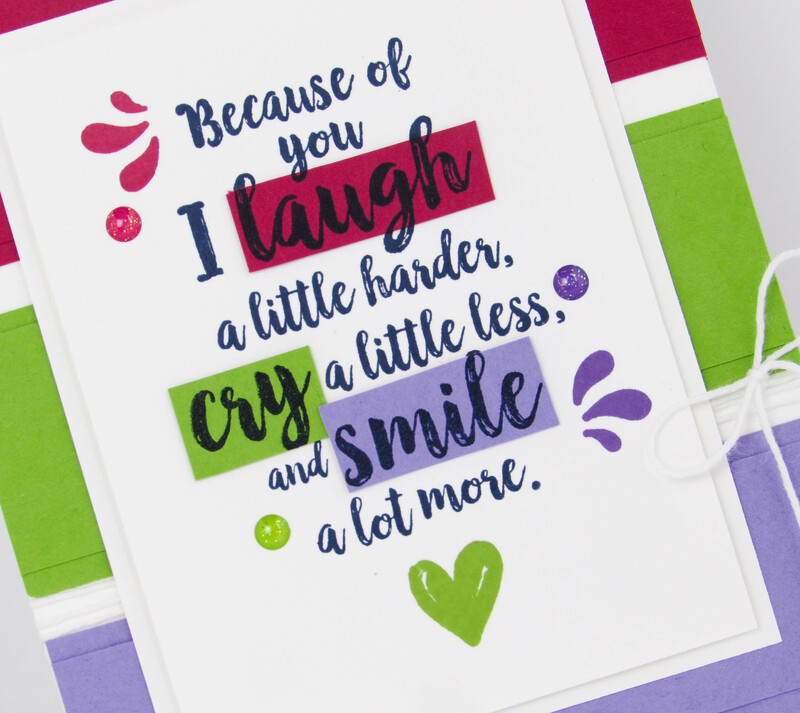 Match up the cut out words and adhere them to the stamped sentiment using liquid adhesive. 7. Next, stamp an accent in Lovely Lipstick at the top left of your sentiment and another in Highland Heather along the bottom right. 8. 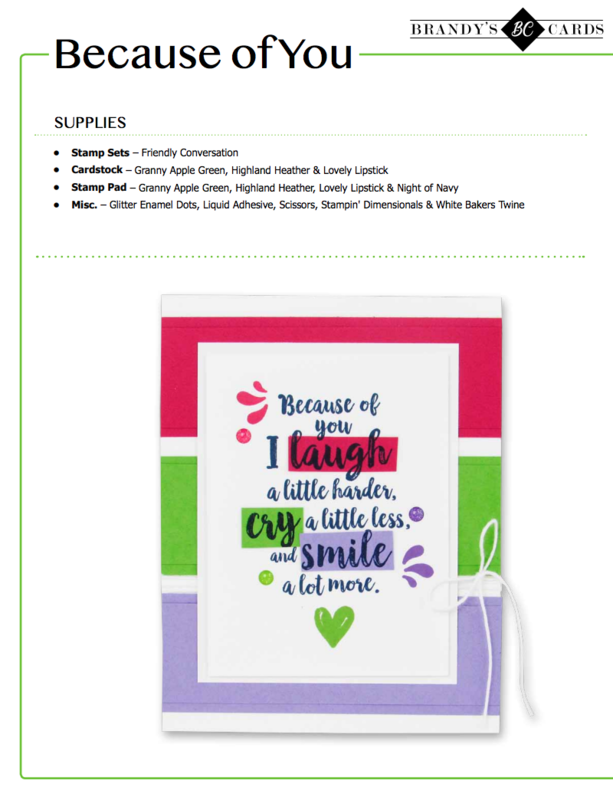 Center and stamp your heart under the sentiment using Granny Apple Green Ink. Tip: Be sure to finish all your stamping before adding the mat behind your sentiment. 9. 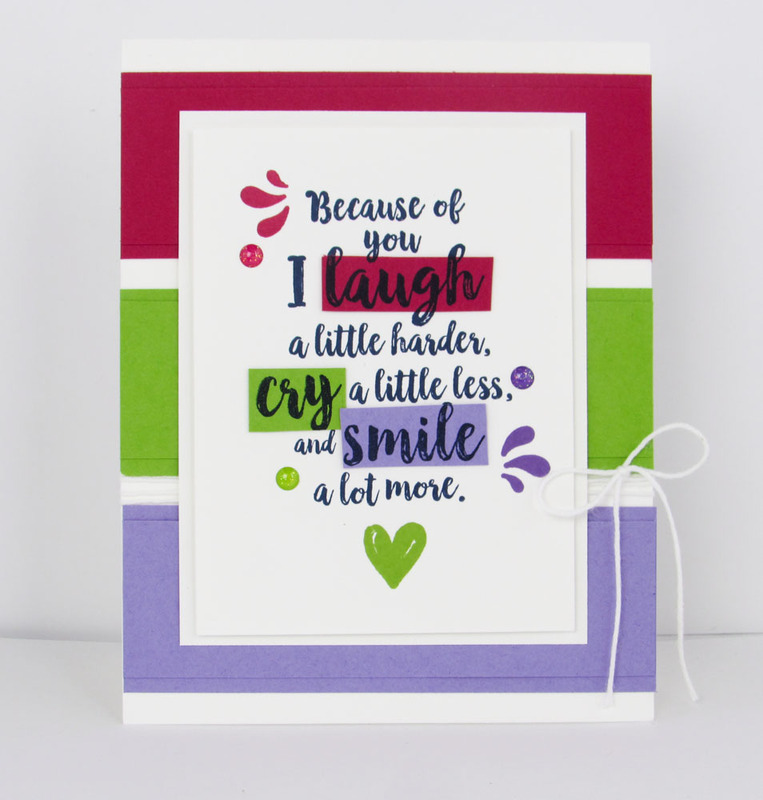 Use Stampin’ Dimensionals to adhere your sentiment on top of the matted piece. 10. Center and adhere your sentiment using liquid adhesive. Finish your card with coordinating glitter enamel dots.